I'm currently abroad and for the first time in a long time I saw the first snow. It was beautiful and I loved it. While I love the snow a lot, the cold is something I could do without. My skin has been so angry at me and I've been trying to take extra care of it. Still, it's not used to the new environment and the harsh cold so it's been rebelling hard. I think my skin misses the warm weather from back home and so do I. However, I will be back soon so I will enjoy every moment I have here. The harsh cold has brought along something I haven't had to think about in a long time and that is chapped lips. However, I'm not worried because I am prepared. My lip care kit has all the products needed to keep my lips soft, smooth, and hydrated. That brings us to this week's Pure Smile Choosy Lip Pack review. This past weekend I used this Choosy White Pearl lip mask and it was a treat for my lips. Like the other Pearl lip masks from Pure Smile's Choosy line, this one provided all the lip care benefits I was looking for. Let's get to know it! Product Description: The Pure Smile Choosy Lip Pack in White Pearl is a nourishing and moisturizing hydro gel lip mask. It's formulated with unique ingredients to care for the lips. These ingredients are collagen, royal jelly, grapefruit seed oil, sodium hyaluronate, bambusa textillis stem extract, argan oil, baobab oil, and colloidal platinum. These ingredients works together to hydrate, soften and smooth the lips. To Use: Cleanse your lips first. Take the mask out and apply it onto the lips. Leave it on for 5 to 30+ minutes, then remove and follow up with lip balm or lip treatment. For best effect, use a lip scrub before the lip mask. Using the lip mask after a shower/bath also helps as well. Ingredients: Water, glycerin, butylene glycol, ceratonia sillqua gum, xanthan gum, soy isoflavones, prunus amygdalus dulcis (sweet almond) oil, butyrospermum parkii (shea butter), royal jelly extract, honey extract, niacinamide, calcium pantothenate, sodium ascorbly phosphate, tocopheryl acetate, pyridoxine HCI, malt dextrin, silica, sodium starch octenylsuccinate, hydrolyzed collagen, beta-glucan, sodium hyaluronate, chondrus crispus (carrageenan), adansonia digitata seed oil, argania spinosa kernel oil, citrus grandis (grapefruit) seed extract, bambusa textillis stem extract, pinus palustris leaf extract, allantoin, ricinus communis seed oil, calcium lactate, polyglutamic acid, colloidal platinum, PEG-60 hydrogenated caster oil, fragrance, disodium EDTA, mica, titanium dioxide. I've highlighted the ingredients unique to this White Pearl Choosy Lip Pack. I've done this with all of my previous Choosy Lip Mask reviews as well. This gives you an idea of what's different between each lip mask. Packaging: The basic packaging style is the same for Pure Smile's Choosy lip masks. However, with their Pearl line, there are more designs and the front picture is different per mask. 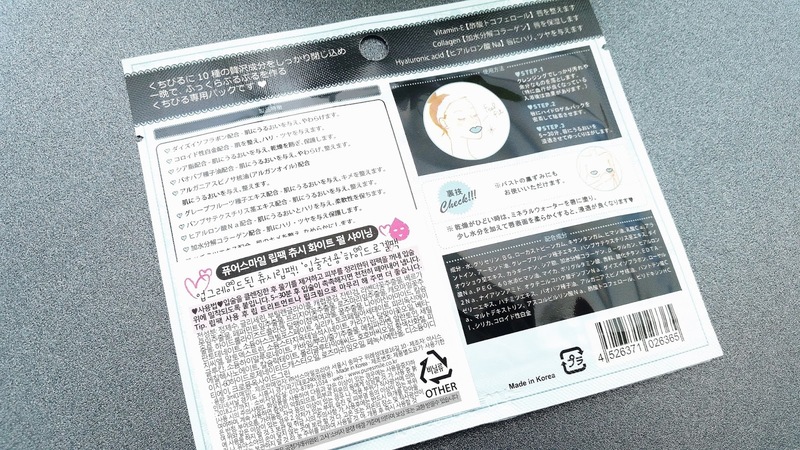 Depending on the shop/distributor you purchase your lip mask from, the translated instruction sticker on the back will be different too. 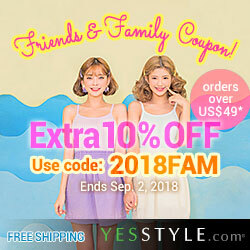 This one (pictured above), I purchased from Korea in my KoreanBuddy haul so the instructions are in Korean. Luckily I have another and the other one is bought locally, so it has English information. 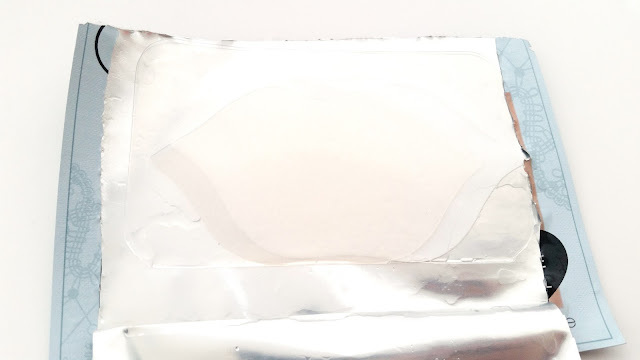 Inside the package, the lip mask is protected by a folded layer of plastic and an thinner white plastic on the inside. Scent: According to the packaging, the lip masks have a frangipani (aka plumeria) scent. To me, it does has a sweet floral scent to it with a hint of fruitiness as well. However, like all Choosy lip masks, you can also pick up the hydro gel scent. The mix is not unpleasant but I kind of wish the plumeria scent was stronger. 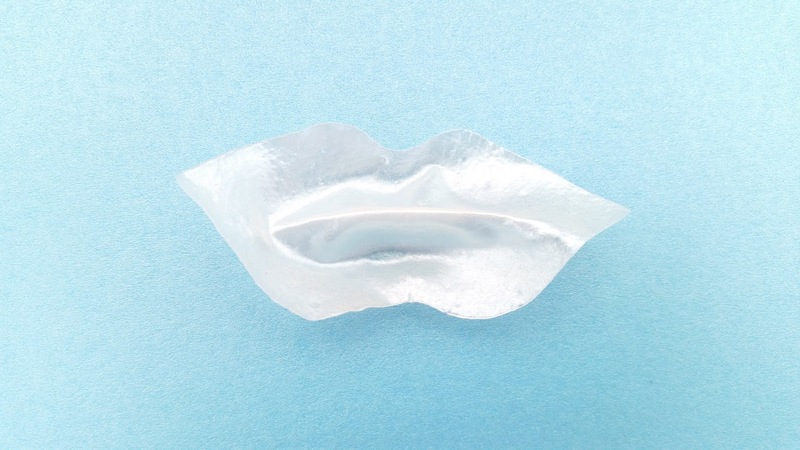 Color: The lip mask is white and opaque in color. As you can see in the picture below, the white almost blends in perfectly with its plastic protective layer. Texture: Flexible, light, and adheres easily. It feels like any other hydro gel masks but it doesn't have a mesh inside. Making it easy to mold against any shape. Michelle's Thoughts: It might just be me, but it seems like all the Pearl lip masks work wonderfully for my lips. At least, I've had the most success with them. I think I'll need to restock this entire line. Even though the cold weather caused my lips to become chapped this past weekend, my lip care routine fixed it right up and this lip mask played a big part in it. Maybe it's the shea butter or the almond oil, or a combination of it and all the other moisturizing ingredients this Pure Smile Choosy Lip Pack in White Pearl contains; but this was the most moisturizing lip mask I've tried so far. My lips and I were super happy with the lip care effects it provided. It was able to provide intense moisture to my lips, leaving it soft and smooth. Not to mention this lip mask contains platinum, which just sounds luxurious. Although, platinum is towards the end of the ingredient list, so there's probably not that much in it. Still, the ingredient list is packed full of nourishing and moisturizing ingredients. It really came in handy when my lips needed it the most. Like always, I left the lip mask on for about an hour to maximize its effects and add a little plumping effect as well. The suggested duration is 5 to 30 minutes, but personally, I like an hour or so the best. Just don't let the lip mask dry on your lips, peeling it off is a pain. (I would know, I fell asleep with 1 on once.) After I removed my lip mask, I just followed up with my lip treatment to seal it all in. If it's during the day, I would have my lip balm on hand to help elongated the lip care effects. Lip mask after use. It has sort of retained my lip shape. Final Thoughts: I'm extremely happy with this White Pearl lip mask. It really came in handy when my lips needed it the most. The lip care benefits it offers saved my lips from the harsh cold weather. With other lip care products, like lip balms/lip treatments, I can elongate these lip care benefits to keep my lips soft, smooth, and hydrated throughout the week. Would I repurchase this lip mask in the future? Yes! I love it a lot and I will certainly restock soon. Do I think this is worth a try? Yes! The White Pearl lip mask provided all the lip care benefits needed to keep the lips moisturized, soft and smooth. I believe it's worth a try and if you supplement it with a good lip care routine it can even keep your lips from becoming dry or chapped. There are also a ton of other Choosy lip masks to choose from as well in case you are looking for another 'flavor'. Pure Smile Choosy has 3 lines of lip masks, the Original (which includes Peach, Milk, Fruit, Herb, and Honey), the Pearl (which includes Pink, Purple, Black, Gold, and White), and the Art line which includes lip masks with unique designs.